Looking for deeper insight on markets? In tonight’s Closer sent to Bespoke Institutional clients, we discuss the outlook of small caps given the Russell 2000’s strong breadth over the past several weeks. We also make note of the Consumer Discretionary sector’s outperformance relative to Consumer Staples to a greater degree than predicted by the ten-year yield. 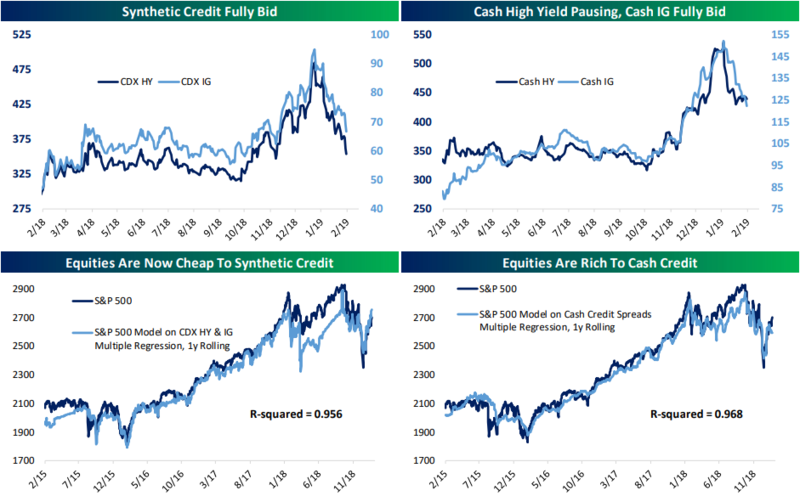 Staying on the topic of outperformance, next, we turn to synthetic credit default swap indices as they outperform cash high yield bonds. We then take a look at the S&P 500’s revenue growth to see that despite apparently peaking indicators, the economy is still healthy. Further in economic data, today saw the release of November (the indicator has been postponed due to the government shutdown) manufacturers’ orders, shipments, and inventories which we provide an update to. We finish tonight with an update on the Canadian economy by taking a look at consumer confidence and auto sales..